I watched Alan Yentob’s excellent Imagine documentary (BBC) about the work of Vivien Maier, a nanny (now dead) who took 150,000 photos of things she liked, or which interested her. Her photos are excellent, mindful of the work of Robert Frank and Diane Arbus, and the story behind them is quite extraordinary. Because it seems Vivien never studied photography, never knew any photographers, never showed anyone her work, and printed only a few of her photos. She stored her negatives in 5 storage lockers in Chicago that she continued renting for years. But when she got too ill to pay the rent, the contents of the storage lockers were sold to auctioneers, sight unseen. At this point all the work could easily have been trashed, except the buyer of the job lot realised they must be worth something and sold the entire lot to another dealer. From there, a spiral of buying and selling, and a growing admiration for her work brought serious acclaim. Now her vintage prints sell for $ 8000 and new ones for $ 2000. A great post mortem success story, like Van Gogh’s. But the part of the film that impressed me most was a comment by photo gallery owner Stephen Kasher, about how she ‘created’ her style. 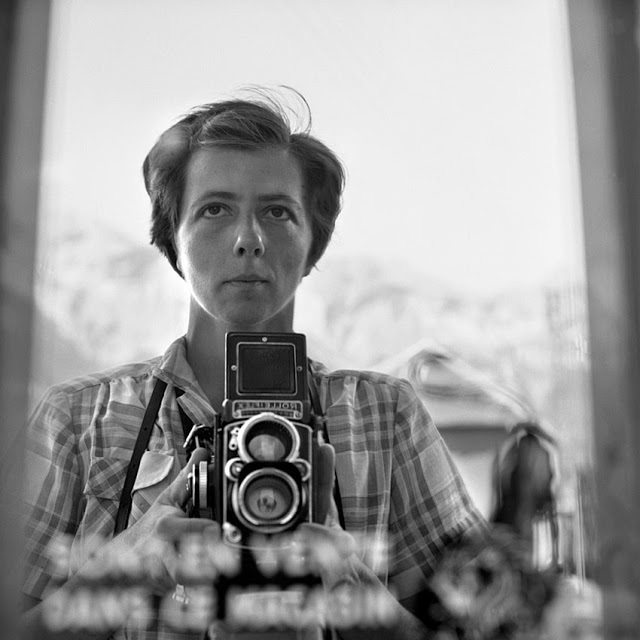 Vivien Maier has a distinctive visual style, all her own. How did she create it ? Kasher said she is one of the few photographers with no (photographic) outside influences. She never exhibited, published or sold her work. Because she had a day job she did not have to take photos to please anyone but herself. She didn’t sell them or show them. They were private, and so she could take photos of whatever interested her, and over time work out the best solution for obtaining the images she wanted. This best solution was to solely satisfy her creative urge, to get the best shot she could. So Vivien Maier had Freedom (capital F) to do what she truly wanted. She took photos only of what interested her, and she took them at as high an artistic standard as she could achieve. So her style comes partly through technique (the type of camera and film she used), her vision – what she wanted to shoot and the feelings and ideas they conveyed to her – and her self-effacing persona, which could be unobtrusive and capture people ‘acting’ naturally. Or should that be acting ‘naturally’? So the essence of Vivien’s style did not come from the outside- from her equipment or other photographers- but came from the inside- from her thoughts and emotions, from the way she saw the world. Writers are always told, “Write what you know about.” And I suppose Vivien did photograph what she knew about- kids playing on a beach, street people in Chicago, the life of a flea market. But maybe a better way of saying this, and one which can be imported by other creative artists is “Write or work about what interests you. What interests you is something you will be able to express for yourself. ” Just like Vivien. And her great posthumous fame tells us that the more freedom we can give ourselves. the better the work we will do, whether others recognise it or not. Leaving money aside (and I know that is not easy), what Vivien’s story says about creative work is that if you can work at your art or craft without deviating from what interests you, not trying for recognition or fame, not trying to make money, but only trying to perfect your abilities, then you may make something that lasts.